In today’s uber-optimised digital world, we all know how important speed is. Advances in things like page speed and shipping times have conditioned us to expect instant results. And brands are trying to deliver – optimising every element of their site to give consumers a frictionless browsing experience. But there’s one area that’s still slowing customers down – support. The average time consumers will wait for a page to load is 2 seconds. After that, bounce rates start to skyrocket. And yet, the average response time to handle a customer service request is 12 hours. That’s a whole day for your customer to change their mind, or shop somewhere else. So, how can brands start to bridge this gap? How can customer support become as instantaneous as every other part of your site? The solution seems simple – install a live chat function on your site. But with dozens of apps to choose from, it can be difficult to know where to start. That’s why we’ve laid out some of the best live chat apps for your website, as well as how you can use live chat to improve your conversions. Despite the rise in popularity of brands offering support through Twitter and Facebook Messenger, live chat remains the preferred support channel for 41% of customers. From questions about discount codes to queries about delivery, good customer support is essential for reducing buyer hesitation. But not everyone is willing to go through a call centre. Whether it’s shyness, anxiety or simply not feeling like they have the time, your customer won’t always want to pick up the phone. By offering an instant way for them to ask for help, you can reclaim what would otherwise be a lost sale. Live chat also means your customer can access support directly through your website, allowing them to continue shopping while they’re waiting for a response. Instead of them hanging around listening to on-hold music, you’re giving them the opportunity to add more products to their basket while they wait. One of the reasons customers prefer live chat is due to the fast response times. Not only do these quick responses help improve your conversion rates, but they also build up a better relationship with your customer. Great customer support makes customers feel valued, meaning they’re more likely to shop with you again. Aside from improving your repeat-purchase rates, live chat is also a much cheaper support option than call centres. In fact, according to Telus International, customer service agents can engage in up to six live chats simultaneously, saving businesses over 50% in support costs. The bottom line is that the more brands use live chat, the more consumers expect it as a support option. And if you don’t give them that option, you run the risk of alienating your customer and losing sales. Ultimately, the extra sales and increased brand loyalty will likely offset the cost of any live chat software. With that in mind, here’s a roundup of some of the best live chat apps for your website. Zendesk Chat is an extremely customisable messaging feature, allowing you to create a personal connection with your customers – without interrupting their shopping experience. It’s also incredibly easy to set up and integrates with most ecommerce software, including Shopify, Magento, WordPress, and many more. With in-platform analytics and a variety of design templates, Zendesk is an incredibly handy tool when it comes to converting more customers. Price: Between $0 and $49 a month. The price depends on how many customer service staff you need using the system – Zendesk Chat has a free plan for one concurrent chat with a 30-day chat history. Best for: Any business looking a simple, cost-effective live-chat feature on their site. 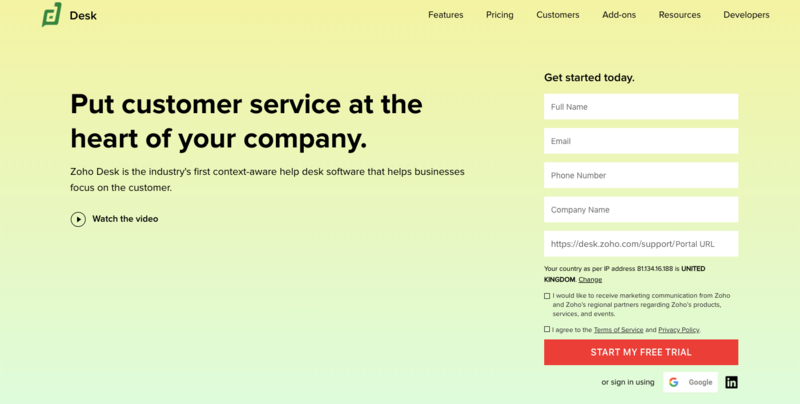 If you’re already using Zendesk customer service, this one’s a no-brainer. Intercom is more than just a live-chat feature – it’s an all-in-one customer messaging platform. Aside from customer support, you can use Intercom to acquire new customers, convert leads and send targeted email and push notifications. Price: The live chat feature costs between $0 and $127 a month, depending on which plan you choose. Best for: Businesses that want to combine their support, marketing and sales efforts into one handy platform. With automated messages, real-time reporting and easy-to-use management tools, Olark market themselves as ‘the world’s simplest live chat software’. Shortcuts and searchable transcripts help speed up your customer service tasks, and the customisable design means you can adjust the platform to fit your needs. Olark works with almost any web software, including Shopify, Magento, HubSpot and MailChimp. If you’re looking for something simple and quick to set up, this might be the live chat option for you. Price: $17 per agent a month, with discounts if you pay annually or biannually. Best for: Anyone looking for a straightforward live-chat option. 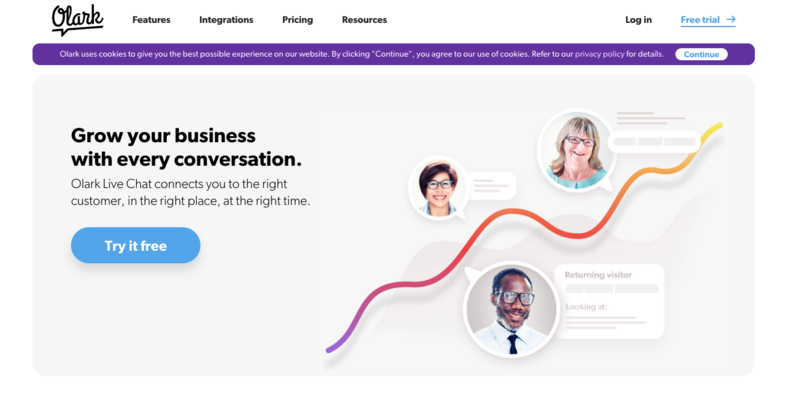 LiveChat’s clean and easy-to-use interface have made it a market leader in customer messaging technology, with over 26,000 businesses currently supported. With push notifications and colour-coded icons, LiveChat enables you to offer faster, easier support to your customers. And with over 130 integrations, you’ll be able to connect it to almost any system you use. Price: Between $16 and $149 a month per customer service agent. Best for: Anyone looking for a powerful LiveChat tool across desktop and mobile apps. Zoho Desk is the live chat software that helps you put customer service at the heart of your company. By analysing performance metrics and automating repetitive tasks, Zoho streamlines your customer service, allowing your employees to spend more time helping customers. If you’re already using their other apps, Zoho Desk might be the perfect live chat option for your site. By connecting it with Zoho’s CRM, you can feed essential customer data into your customer service efforts, giving a more personalised level of support. Price: Between $0 and $25. The free plan gets you access for three customer support agents, basic reports and remote support. Best for: Businesses looking for a cost-effective live chat feature.